We got a chance to talk to the CEO of SteelSeries to talk eSports, gaming, and more. Check out the full interview here. If you have been watching ESPN over the last few weeks, you may have noticed that video games have been getting their fair share of publicity as of late. You may have also noticed that eSports is getting a far more legitimate share of love and the scene is growing radically. I had a chance to have a sit-down with Ehtisham Rabbani, CEO of SteelSeries, about eSports, the role of sponsors and the future of the industry. Check out the full interview below…. Josh: Let’s start with the basics here, how long has SteelSeries been involved in eSports? It was humble beginnings with Jacob Wolff-Petersen, but can you give us a crash course on the history? Ehtisham Rabbani: Way back in 2001, almost 15 years now, there was a very specific need that a fledgling eSports franchise, Ninjas in Pyjamas, was looking to fill. Obviously this was before they were world famous and anyone knew them, in fact eSports was still a very small and niche activity. In talking to them the discussion came to the fact that they were frustrated that they would travel a lot and throw their mouse and keyboards in a bag and travel to different LAN parties. Depending on where they were, their mice would work differently. Part of this was because the surface they would use their mice on was different wherever they would go. There was never any consistency. The second part was that this was in the days of the trackball. If you remember with a trackball, you had to dig out the ball on a regular basis and clean it because once dust got in there, it would really interfere with the operation of the mouse. Ninjas in Pyjamas were having issues with dust getting onto the sensor and effecting the performance of the mouse. The solution was to come up with a surface that was extremely dust resistant that provided the ability for the mouse sensor to work flawlessly, regardless of the surface the mouse pad was placed on. That was the genesis of SteelSeries’ first mouse pad, which was made of glass. It was the only surface that was dust resistant, fought dirt pretty well and was relatively portable. That was our start in 2001, our very first product, The Icemat. It was made specifically for Ninjas in Pyjamas and the took in on the road to the CPL Counter-Strike World Championship. People saw it there and while it was brand new, it solved a real problem. Jacob Wolff-Petersen was there with the first few SteelSeries employees and they sold a bunch of these products. The highlight though was that Ninjas in Pyjamas won the tournament. They won it in an incredibly dramatic fashion, they came back from being down by a considerable margin. That’s how it all started and we haven’t strayed from that in all this time. Almost every new product we design starts with ideation with the eSports teams we work with. We constantly watch to see how they use our products and how we can make them better. They’re involved in the design, testing and validation phase, all the way through. J: The Ninjas in Pyjamas story certainly draws some parallels to what Evil Geniuses just did at The International 5. ER: Oh man, that was a nail-biter. I was on the edge of my seat. In fact, being a little bit of a pessimist from time to time, I thought they were done. I thought there was no way, especially when they played how they did at the start. J: On top of that, they were the first American-based team that has had real success in the MOBA-scene in ages! ER: It was great to see that. The great thing with eSports is that it has become a global uniter. When you think about it, what other sport is massively strong in both the US, Europe and Asia? So soccer is huge in the rest of the world, but not necessarily in the US. Here, we have American Football and Basketball, which again has following in other countries, but eSports is truly universal. J: On that topic, one of the questions that was asked from our social media was if you thought that streamers were to professional eSports teams as recreational football teams are to the pros? ER: Yeah! Absolutely! I think that they are an essential part of developing eSports. In fact I think that eSports in entirely democratic. That is what has helped catapult it. It opens its doors and almost anyone can participate in some form or fashion in eSports. Streamers make that even more possible. When you look at the well-established other sports, your role is to be a spectator. You can join a fantasy league, but that will never get its own huge following. Only on eSports can you go on Twitch and broadcast your games and have a voice. Pretty much anyone can form a team and participate in eSports, it’s wonderfully democratic. J: I just heard a story that described how one of the players for Fnatic got his start in writing a guide to help other League of Legends players do better in rank. Now he is on the team and has a real shot at helping Fnatic get back to Worlds this year. ER: It’s wonderful. I don’t know if you’ve seen the little shows that we did on the Fnatic players. It’s on our website and it’s about the League of Legends team and there’s a 30 minute in-depth story on these guys and their stories. You should check it out. J: Absolutely, we’ll share it with our readers. Sponsorship obviously is a big part of eSports now, how does that role differ from individual sponsorship to team sponsorship? ER: Well, there are different types of sponsors. There are sponsors that use eSports to reach that demographic. Their role is to bankroll eSports and to bankroll the teams. The make sure that teams have the facilities they need to be able to do this full time. There is some really big companies coming in and that is great because it helps grow eSports by providing the cash that is needed. Then there are other sponsors, like SteelSeries, whose role is to provide the tools that these guys really need to advance the sport.Games have come a long way and as eSports broadens you have card games like Hearthstone all the way to MOBAs and MMOs and strategy games all coming into the eSports arena. The tools that you need to win at these are equally as broad. I think those sponsors provide the weapons to win for teams and individuals. J: Well, with that being said, what kinds of products do the pros usually look for the most? ER: It depends, for MOBA games they look for mice that are comfortable and have an extremely accurate sensor, which is why we have different mice. You don’t want a mouse that overprocesses. There are some mice out there not that actually takes away from your PC and uses up your computer’s processing power. They want one with self-sustaining power. They want buttons that have exactly the right type of resistance, if the actuation is too little you may accidentally hit the button and if it is too much you are taking away energy to hit the button. Actuation has to be just perfect. I could go on and on but it is about getting each one of these details absolutely right. When you or a pro gets the product in your hand, you shouldn’t have to think about any of this because we already have. J: So the pros really do have a lot of input into this? ER: We are physically measuring with our eSports players how much force their thumb places on a button. What is exactly the right actuation force? For instance on the new M800 keyboard, when we were designing the QS1 switches, we spent a lot of time figuring out the perfect time at which you want the switch to recognize a press. That amount is 3mm and you want about 40 to 45 grams of weight. ER: (Laughs) Yeah. It is absolutely a science and we are doing a whole bunch of work right now with headsets to find the perfect type of microphone and what the perfect amount of pressure on your head is. All of these things have to be taken into account. What makes it much more interesting is that human beings are very different. We have to design something that works well with a multitude of players. One of the things that has become important to us is to make sure we have a wide variety of eSports teams working with us. Getting that diversity of thoughts and needs is critical to our growth and future. J: Wow. Here’s another community question. How soon will it be before major eSports leagues land a major TV deal? J: I believe they are asking when we’ll see an entire tournament and not just finals. ER: Bold Answer? It’s going to be next year. Next season will be when you’ll see this regularly on TV. J: Which league do you think will break the barrier first? ER: Well, League has the numbers, with DOTA in a close second. Whichever sport does the best job in packaging the games for a TV audience, rather than a streaming audience. J: I’d imagine my experience as a player is different from that of someone flipping through the channels. ER: If you take the numbers right now, there are 89-90 million eSports enthusiasts in the world, globally. These are folks that watch eSports, there are even more that are intrigued by eSports and they want to get into it but they may need a little bit of hand holding. Imagine doubling your audience by taking a more inclusive view. Stepping back and saying “You know what? We’re not going to assume everyone understands this game”. They’ll need to help them get into it and get them immersed. That will help the TV part happen much faster. J: Another community question. When will we see more pro-licensed gear? ER: All of our gear is pro endorsed, we don’t launch it if it isn’t. As far as licensed products, it depends on the teams. Some actually want it and we’ll do it for them but some don’t care. J: So, being CEO probably doesn’t mean you have a lot of time. Do you ever get a chance to roll up your sleeves and throw on some sweatpants and play some games? ER: Oh man, I’ve been a gamer my entire life. One of the things that happens is that when you work in a business that you love is that you find you have less time to do it for yourself. I try to carve out at least one day a month where I say this is my gaming day. Not nearly as frequently as I like. I get to watch a lot though. J: What’s your poison? Which games get that one day a month? ER: I’m a huge RTS and RPG gamer. My all-time favorite game is Age of Empires. The game has defined it’s whole genre. I enjoy watching MOBAs but I really don’t play them. It’s really interesting now because you can actually separate games you play from games you enjoy watching. That distinction didn’t exist a few years ago. J: Which game do you think has the best shot at being the next big eSports title? ER: Every publisher seems to develop new products with an eye for eSports and that is great. We’ve probably not even seen the next big one, but the game that is out there right now that I think should be a much bigger player in the scene is World of Tanks. It should be as big as any of the other MOBAs. Why do you think it hasn’t become bigger? J: World of Tanks has put a lot of money into ads. I think with eSports and gaming currently, less is more. Free to play games that get ad-time now are games like Candy Crush, Boom Beach or Clash of Clans. On an eSports level, that is dangerous company to keep. It looks way too casual and that probably hurts it. ER: I think once eSports is on TV more, people will see it and realize it is watchable and fun. That is the one I’d pick. J: As far as your pro-sponsored teams go which team do you think will be next to take it to a championship level? ER: I think they all can. When we sign a team, we don’t necessarily sign winners, we sign teams that have what it takes to be winners. That includes a love of the sport and not just a love of celebrity. We look for a teams that want to put the work in and an appreciation for the tools that help them be successful. No one could have predicted EG would have won TI5. We knew they were good but the reason we were drawn to them was because they had potential. Like when we signed Fnatic, we are drawn to emerging teams. I think you’ll hear from us soon about new teams, these will be teams we are placing big bets on. They aren’t in the spotlight right now but they will be in the future. J: What’s the future hold? ER: We are using a new way to collaborate with our teams that no one has done before. We think if you are truly serious about eSports and providing the gear they need, you have to go beyond a casual relationship. There are also many colleges around the world that are now have eSports teams and that will change where eSports teams come from. The strength of eSports teams will benefit from that and will now have a minor league system. It will help us be involved at a grassroots level as well. J: So if I think I have what it takes to be sponsored by SteelSeries, where do I start? ER: On our website, we have a way for folks to reach out to us and tell us a little about themselves. We are looking for folks that are passionate about their sport. Obviously folks that enjoy fans of the sport as well. One of the things that annoys me personally is when you have an eSports or any pro player that are annoyed by the folks that surround them and love the sport. I have no patience for that. J: I’m so happy that you were able to give us some input on SteelSeries and eSports. One final question from social media. When will we see a true 5.1 or 7.1 headset out of SteelSeries? ER: Very good question! Stay tuned! 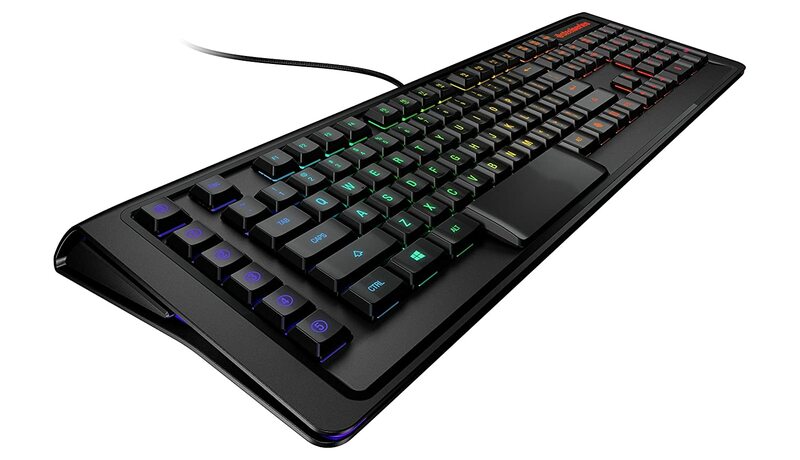 There you have it, big things are on the horizon for SteelSeries, including some new gear. We’ll be following up with Travis Hezel, Director of Global Sponsorships, this week as well as part of our eSports coverage. See you then! Get this amazing HDTV TV antenna from Amazon for only $17!